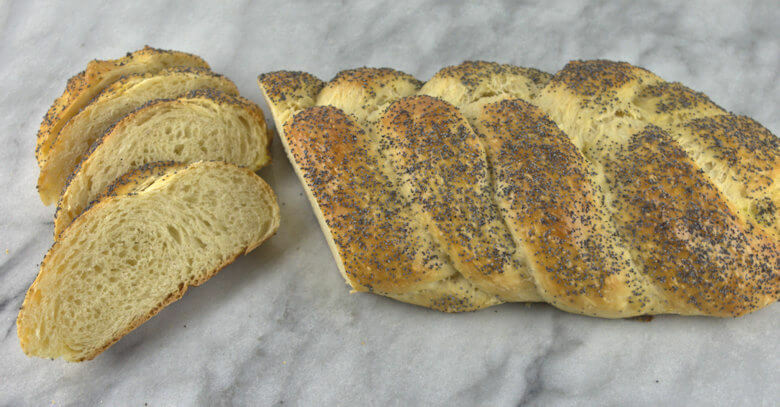 This Braided Bread with Poppy Seeds is a lovely bread, easy to make, and only slightly sweet. Great for a late Sunday morning breakfast, with a thick layer of butter or as a French Toast. Look at the picture, you can almost smell the sweetness. I would easily make this bread again and start experimenting with bread puddings or other recipes in which bread plays the leading role. 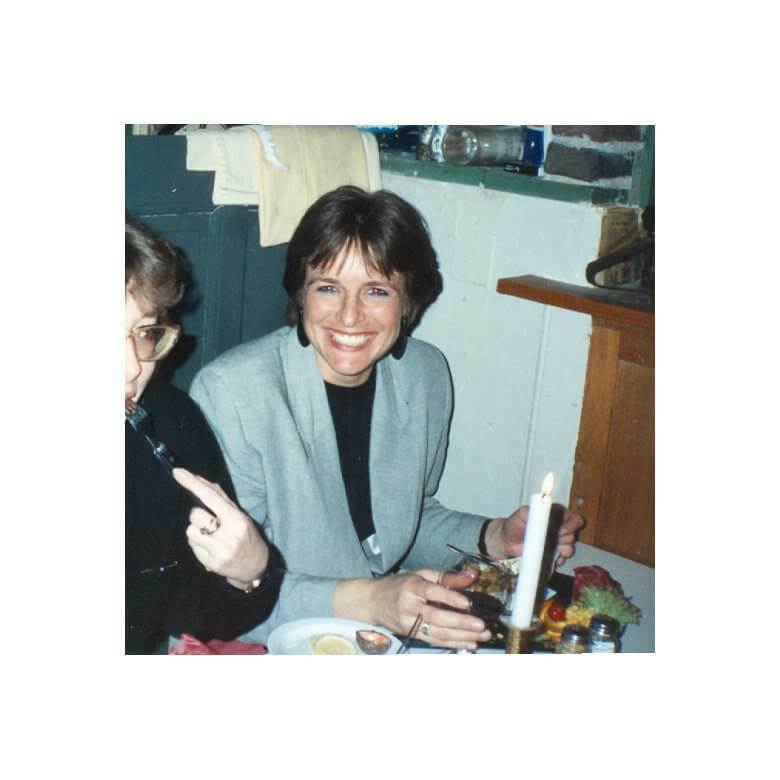 Born in The Netherlands, I grew up with bread at breakfast and bread at lunch-time. Simple sandwiches like cheese, cold-cuts or sweets like marmalade, peanut butter, Nutella or chocolate sprinkles. When I grew older, and times were changing, breakfast and lunch became a little more diverse, but bread is still an important part. May be that’s why there are so many small bakeries in Holland, all selling a darn good variety of bread. Most Dutch grocery stores have their own bread counter with almost the same variety as the smaller bakeries and the packaged, pre-sliced bread is not awfully popular. 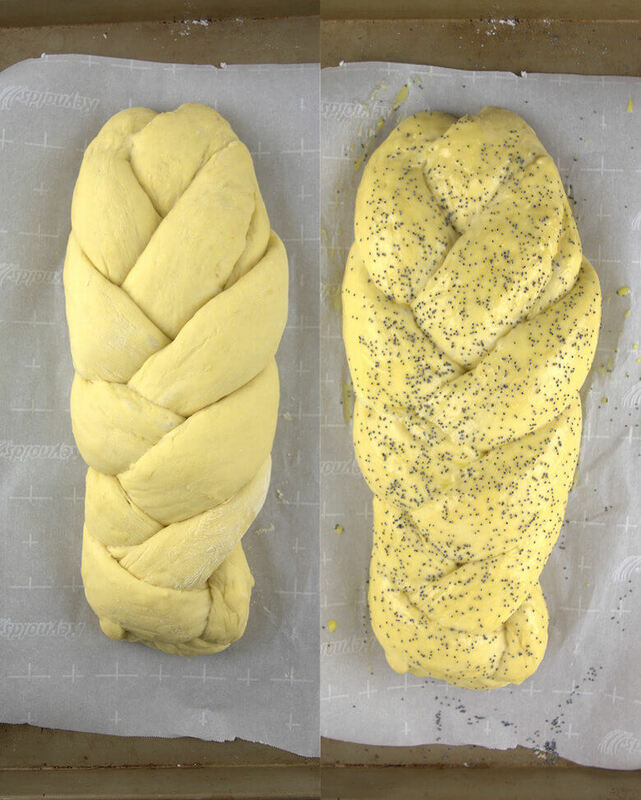 When I started baking my own bread, most of the time, I was trying a type of bread that I was not so familiar with, like this Braided Bread with Poppy Seeds, very similar to a challah bread. Baking bread is for me about the flavors, the smells, the satisfaction that the dough becomes a bread. It is often not a perfectly looking creation. A perfect bread? Can you give a definition? I cannot not. I am far from perfect, so how the heck would I be able to make a perfect bread. One thing I know, I am perfectly me, with all the flaws and imperfections. The photo above shows how imperfect the loaf is. It has a little belly, off center, but it is well-braided, it stays together and it has a wonderful light interior. That is good enough for me. It does not taste any better when it has the perfect shape. How to make this bread. Take a look at the recipe below. It is a dough with eggs, sugar or honey and butter, so different for a normal bread. Clearly a rich bread and you will taste that. 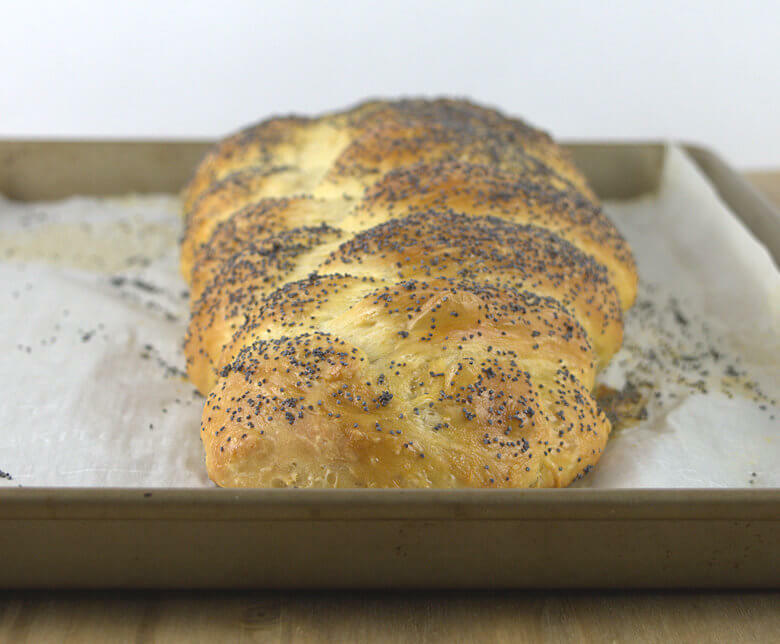 The fun with making this Braided Bread with Poppy Seeds is the braiding itself. You can go with 3 strands or with 5. Of course, I tried with 5 and I have tried several times and basically the bread comes out the same; a little uneven. I read that you should start in the center and then work your way to the end, a method to get a more balanced shaped bread, but with 5 strands, I have not figured out how to do that. Will continue trying and will update you when I know how to do it. Mix flour, sugar, yeast, salt, eggs, butter, and water in a bowl. Use a stand mixer or wet hands to incorporate all the flour. Knead the dough a little bit, create a ball. Cover bowl and allow to rest and rise in 1-2 hours. Dust your counter with flour and knead the dough a few times. Cut in 5 equal pieces and roll each out, forming a rope with a length of approx. 12 inches. Each strand has the same length. Now the braiding starts. Push the 5 strands together at 1 end and start braiding and push the strands together at the other end. 5 strands makes for a more complicated braid. Take the right strand and pull it over 3 strands, so it becomes the 2nd from the left. Move the left strand to the right, over 2 strands, so it becomes the middle one. Now move the 2nd strand from the left and pull it over the middle strand. At this stage you will end up with a braid on the left side of the strands. Now repeat the process. Pull right strand over 3 strands, then pull 2nd strand from the left and pull over the middle one. Etc. At the end push the strands together. Place the bread on the baking sheet and cover with plastic wrap. Allow to rise for about 1 hour or until doubled in size. While the oven is warming to 350 degrees F, make the egg wash by mixing 1 egg with 1 tablespoon of water. 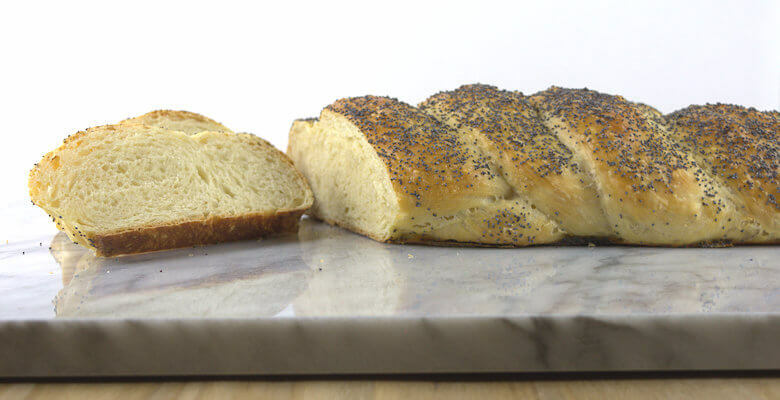 Brush the bread with the egg wash and sprinkle with poppy seeds. Place bread in the oven and bake for approx. 35 minutes or until golden brown. Allow to cool before you cut the loaf.